I was in a bad mood, it was late at night, and I certainly didn't want to go to the grocery store in the dark and the cold. But we were running dangerously low on food staples and unless we wanted to kids to riot over powdered milk in the morning, one of us had to go. I opted to go shopping while Phillip put the kids to bed, and when I came home he asked, "Did you buy something to make yourself happy?" Still grumpy, I rolled my eyes and grunted, "They don't sell happiness at Market Basket." "Not true. It's in the ice cream aisle." "It's too cold for ice cream." "...They also sell it in the cookie aisle." Next time, I'll let him go to the store instead since he knows so much. Church this week was our bi-annual stake conference, where a group of local congregations (i.e: a stake) gets together for a series of talks/sermons on issues particular to our area. Stake conference is a little bit of a drive for us and the meeting itself was longer than our normal weekly church service, so I told the kids to pack markers so they could color while they listened. I kind of doubt my 7-year-old was really listening, though, because I don't remember a single speaker covering bananas and yet that seemed to be her main takeaway from the meeting. My 2-year-old was playing on the couch when he suddenly looked up at his 12-year-old sister, who wasn't doing anything to him, and growled "I don't like you, go away!" "Hey, that wasn't very nice," I told him immediately. "That hurts her feelings. Tell your sister, 'I love you!'" Putting on a big smile, he said sweetly: "I love you, bye bye!" Apparently you can lead a horse to water, but you can't make him stop telling everyone else to get lost. This week my 9th grader lost her flute, which was a real dilemma for me. I'm a big believer in natural consequences, but what exactly would that be? Saying "too bad, I guess you can't play in the band for the rest of high school since you're so irresponsible" seemed a little harsh, but something about shelling out several hundred dollars for a replacement didn't seem right to me, either! So I turned to Facebook for the advice of the smart parents belonging to the Unremarkable Files page, and let me say you guys are amazing. After all that, I'm happy to report that my daughter found her flute! Apparently she left it in a friend's car (a place she'd previously claimed it "couldn't be") and since the flute didn't have her name on it they didn't know whose it was. As a result, my daughter had to (1) admit that when you don't know where something IS, you also don't know where it ISN'T so just listen to your mother and look where she suggested, and (2) put your name on your stuff. Speaking of lost things, I've been keeping an eye out for a missing library book called The Big Truck and Train Book. As you can probably guess from the title, it's pretty big, so I was really stumped as to where it could be hiding. This week we finally got around to taking down the Christmas tree, and as I contorted myself to reach behind the piano and unplug the lights, I saw the Big Truck and Train Book peeking out at me from among the dust bunnies! I was happy to find the book, and also to get rid of the Christmas tree. Since the back of our property is wooded, we never bother with curbside pickup and just toss our trees back there to decompose and return to the earth. 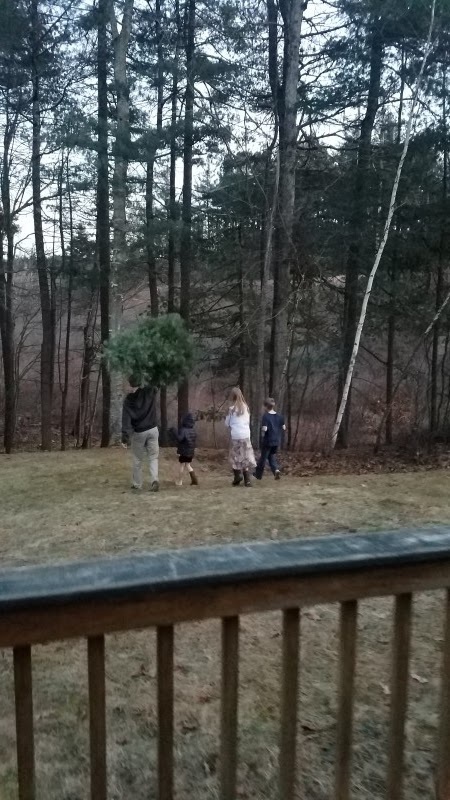 This is one of the kids' favorite January traditions, as you can see from them dancing after Phillip like the children of Hamelin to watch him chuck it into the forest. The funny part is, when we returned the book to the library and went to play in the children's room the next day, my 4-year-old immediately spotted the Big Truck and Train Book on the stack of items to be reshelved and insisted we take it home again. It's January, which means it's time to plan out the rest of your kids' lives, I guess. I've already received not one, but two flyers for summer camp in the mail. 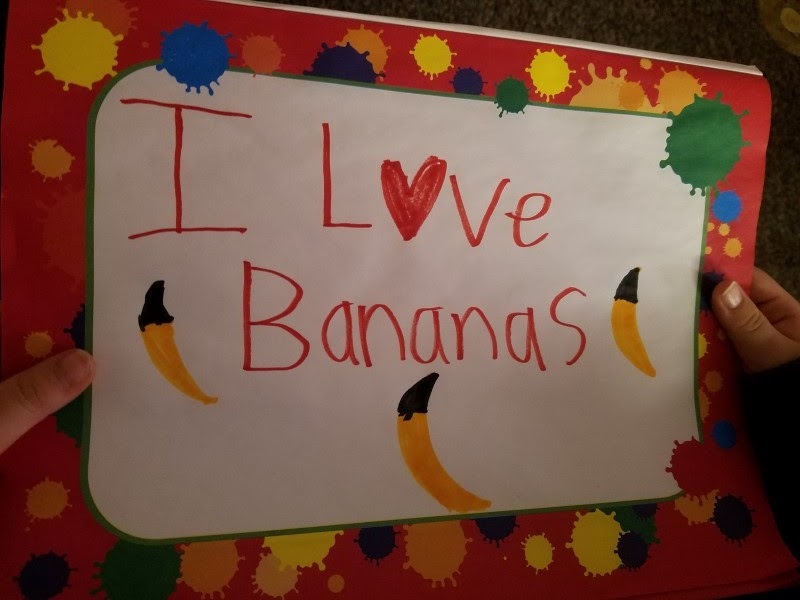 Including this one, where the theme is certainly not "hey, your parents are at work and/or you're driving everyone crazy so here are some crafts to do and maybe a field to run around in for a couple of hours a day." I was just freaking out over how my 7-year-old will score on the SATs, so this is PERFECT. 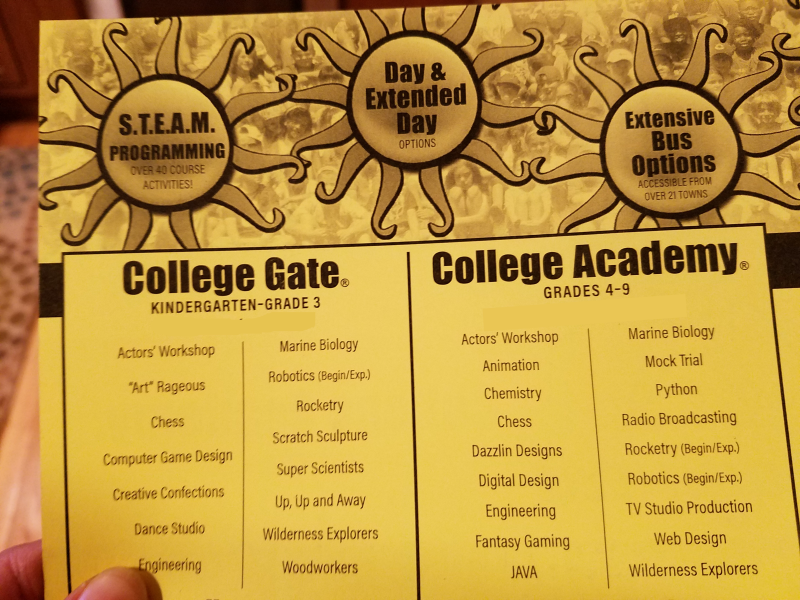 Kindergarten seems like a totally reasonable time to prepare for college, because I also drive by a local day care with a sign out front that says "Now enrolling children 3-12 months." At the end of the term, students are graded on whether or not they've discovered their hands. Seriously, though, what is going on here? Is it not okay anymore to just provide your kids with a safe, semi-fun place to go when you can't be with them? 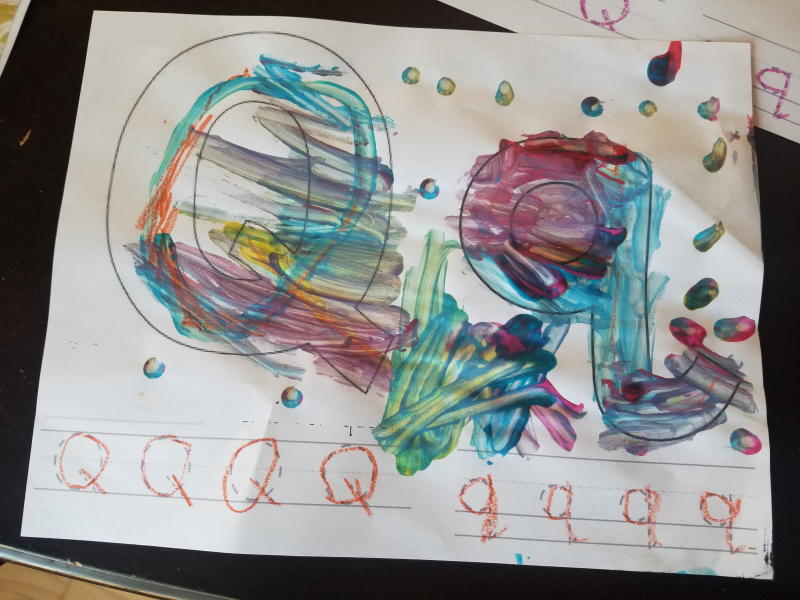 It was my turn to teach co-op preschool this week, so right after we deconstructed colonialist themes in Shakespeare's The Tempest and finished filling out the FAFSA (see Take #6) we did a brief lesson on the letter Q. My 2-year-old joined in as usual, which was especially amusing when the kids painted Qs with q-tips. He kept referring to our painting implements as "earwax sticks," and now I'll never call q-tips anything else. Cyrus has a little friend who is three weeks younger than him, and his parents have already put down a deposit to reserve a place at some preschool...I don't even think it's a particularly special preschool, but apparently this is a thing parents do? I read your post about the flute on facebook--glad to hear that it's been found! When my oldest was 2 he called kitchen tongs "sniffer grabbers". I doubt they'll ever be called anything else. I must admit I drive dad crazy when get is helping me look for something and I tell him "it wouldn't be there". Guys I better change my perspective. And of course that is the perfect name for a qtip. I keep reading about people getting on waitlists for preschool while they are still pregnant and I don't understand. I just don't. I think it's the media. They really did a number on parents and used our love for our kids to propel this kind of lunacy. The next time you hear a college savings commercial from a financial company, listen carefully and you'll see what I mean.